Healthy kidneys get rid of the wastes that come from food once the body has used all of the nutrition in it. When kidneys no longer work effectively, it is often necessary to change the way a person eats. Consultation with a dietitian will be helpful to understand what foods may or may not be appropriate. Although every person needs their own condition-specific diet, there are several nutrients that all renal diets include. • Protein is the building block of our body. Foods rich in protein include meat, eggs, milk, nuts, pulses, dals, and other foods. 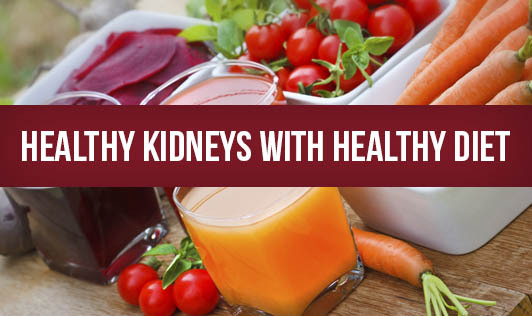 Healthy kidneys take wastes out of the blood but filter out the protein. Impaired kidneys may fail to separate the protein from the wastes. • Cholesterol is another problem that may be associated with kidney failure. High levels of cholesterol in the blood may result from a high-fat diet or a diet rich in animal foods. • Sodium is a chemical found in salt and other additives. Sodium in the diet may raise a person's blood pressure, so people with kidney problems should limit foods that contain high levels of sodium. High-sodium foods include canned or processed foods, instant foods, salt biscuits, and cheese. • Potassium is a mineral found naturally in many fruits and vegetables, such as oranges, potatoes, bananas, dried fruits, pulses, and nuts. Healthy kidneys measure potassium in the blood and remove excess amounts. Diseased kidneys may fail to remove excess potassium. With very poor kidney function, high potassium levels can affect the heart rhythm. • Phosphorus is associated with calcium metabolism and may be elevated in kidney failure. Too much phosphorus can leech calcium from the bones and cause osteoporosis and fractures. Foods with high phosphorus content include milk, cheese, nuts, and cola drinks.